Our third week of the City on a Hill series continues dissecting the Sermon on the Mount, tackling some increasingly touchy subjects as we keep digging deeper. Our main topic of discussion today was ‘Fulfillment of the Law’ with all the connotations and insinuations it entails. Matthew 5:17-20, I have not come to abolish the law, but to fulfill it. In this segment of his message, Jesus is speaking directly to the outwardly religious in the crowd. This is the leading issue that caused such violent back-lash by the religious elite in Jerusalem. Jesus is publicly calling them out for their hypocrisy. Our chosen manner of reception as we read the Bible brings us to a crossroads where we can choose the path of the righteous elite or the path of Jesus. Dean laid this out to us in a way I had not heard before, contrasting prescriptive reading with descriptive reading. A prescription provides a black and white solution to a problem; to get ‘A’ one must do ‘B’. Reading the Bible as a prescription for salvation interprets Jesus’s words as a set of minimum guidelines every individual must stay within. As a result of living life between these lines, you are in right standing with God on your day of judgement. Prescriptive reading leads to a self-righteous world-view. Donald Miller communicated a most excellent description of self-righteousness in a Storyline blog post last week; “When people are self-righteous, they are not getting their sense of righteousness from themselves. They’re getting it from you.” Self-righteous, prescriptively religious people evaluate their self-worth by comparing themselves to everyone else. “At least I’m not living like Bob over there, God must really be happy with me.” or “I’m not as good as Chuck, I need to spend more time at church.” Neither attitudes are spiritually productive, much less attractive to those still searching for their faith. Descriptive reading converts the external interpretation of Jesus’s teaching as a checklist into an introspective evaluation to better oneself into becoming the person Jesus describes. The clearer the image Jesus paints for us becomes, the more we realize it is a life no human can ever attain. The righteousness God requires is an ultimate impossibility for the created human, at least unobtainable on our own. Righteousness is not a status determined by what we do, we must also take into account our motives for doing. Your attempts at being kind to strangers is good, but is not righteous without a genuine concern for the person that outweighs your ego-boost from being kind. As we’ll read in the coming weeks; hate (on any level and toward any person), jealousy (again, of anyone or anything), lust (that buzz you get around that guy or girl this culture mis-defines as ‘love’. Put a ring on it or get away), entertaining any of these attitudes is a blemish on our righteousness. God is perfect, requiring everything in his presence to be also perfect. The smallest blemish puts you on the black-list…….unless. Jesus. Jesus is our mediator, standing in our place before God. He accepts all of our bruises and blemishes so that we are accepted into God’s kingdom as sons and daughters. Jesus is the wall of righteous we pass through, coming out clean on the other side. My inspiration for today’s drawing is actually a painting concept I tossed around more than a year ago. Self-righteous people, like the Pharisee leaders Jesus’s word convicted, look normal (at the least) on the outside, but are rotting at their core. They work to hide their sin by preaching (hollering) against the very things they do behind closed doors. Tying that person in with the Tinkerbell salvation experience from last week’s post and the resulting image is of a spiritual zombie. Where a “real” zombie walks the earth with an insatiable appetite for brains, spiritual zombies hunger for minds, yours and mine. The more minds they can add to their conversion record, the more righteous they become. Their goal is strictly numbers, once they take a bite of your mind, you are counted as their spiritual property and the responsibility to live up to their standards is yours to fail. Spiritual zombies are ingrained with a dogma that they must prove their own righteousness by disproving yours. They are quick to point out faults, boisterously preach the “right” ways to live and worship, then quickly disappear when their true state of equal broken-ness appears. The first appendage to decay on these zombies are their ears. They recoil and strike at the first hint of questioning or disagreement, refusing to hear any argument that does not echo their own position. Real zombies act on hunger instinct alone, travelling in herds to the next source of brains. Spiritual zombies lack the ability to think for themselves as long as their zombie-ism persists. As time progresses, lack of communication and stunted growth leads to cannibalism. When no “unrighteous” people are within striking distance, the self-righteous minds must turn to consuming each other, competing for the title of most-righteous. But there is hope. Jesus, through his life and sacrifice, changed the barrier of the law from a wall in which we face-plant into a membrane we can freely permeate and come through cured. Recognizing the righteous person Jesus describes as our baseline model is himself, a level we can never obtain without his covering, righteousness becomes an lifestyle to live because of, not one to live for. When we live because of the righteous status Jesus has already raised us to, our hands are ready to serve, our eyes look for opportunities, and our ears are open to listen. 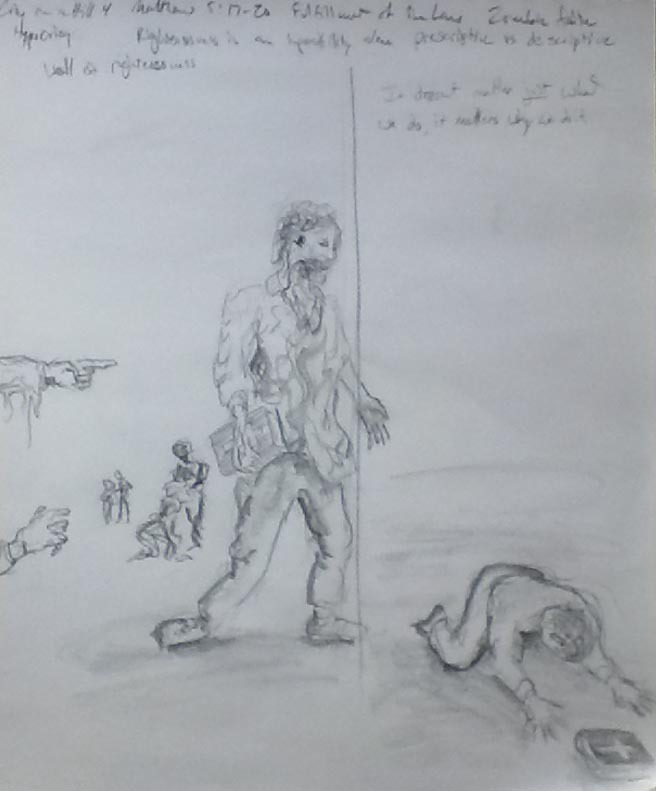 A figure has collapsed on the right of the drawing, as zombie that has been cured by Jesus’s righteous membrane. He lays out his hands, submitting to his inadequacy and the guidance of the gospel; his ears having grown back into operable place. Next Post Spare change and forethought. How I made two new friends at the recycling center today.